Review: Three children move to Yorkshire with their mum after their father mysteriously disappears. While there father is away they soon discover the real reason for his disappearance. The three children go off together and have adventures near to the local steam railway. A classic British Film. One that all the family can enjoy. This will always remain a classic film and will always stand the test of time. A film that you can watch time and time again. This is based on a novel by E. Nesbit. 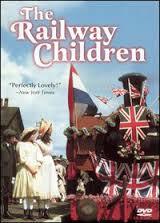 All of the cast acted brilliantly but Jenny Agutter’s performance stands out above everybody else’s. They have done a fantastic job on the costuming. The ending scene is the one scene that will stay with you forever and that you will never forget. Very moving. Apparently this story has been adapted for the screen six times, including four television series. This will always remain the best. In 2010, a festival was held in Haworth, West Yorkshire to mark the 40th anniversary of the film. This is on Barry Norman’s list of 100 Greatest Films of all time that he produced at the start of 2012 and also in his list of the 50 Greatest British Films of all time that he produced in 2013. I just love this movie, so nostalgic.